Happy National Waffle Day! For longer than anyone can remember, waffles have been a sweet, toasty breakfast treat and a staple inside America’s freezers, restaurants, and recipe books. Maybe you enjoy waffles the old-fashioned way, with butter and maple syrup, or perhaps you like them decked out with chocolate chips, whipped cream, strawberries, and other decadent toppings. Or perhaps you like them the really old-fashioned way—no toppings, no utensils—or you’ve moved past traditional breakfast entirely with more adventurous concepts like waffle sandwiches, waffle crepes, waffle pizzas, or chicken and waffles. There's no doubt that the waffle is an amazing, versatile food. 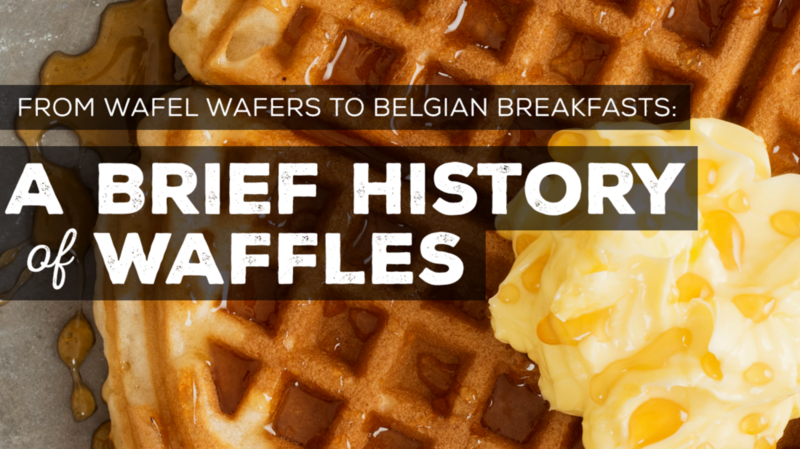 But while most people know their favorite ways to mix, cook, and top their waffle, the history of the food's origins is more vague—Belgian, perhaps? Who toasted the first waffle? And how did it get that distinct grid design, anyway? Food historians trace the waffle’s DNA back to ancient Greece, when cooks roasted flat cakes between two metal plates attached to a long wooden handle. Obelios, as the cakes were called, weren’t particularly sweet or decadent, but their design evolved over time as people began customizing the plates. In Medieval Europe, the Catholic Church made a large, unleavened wafer as a sort of companion to the communion wafer. These oublies (or “wafers,” derived from the Greek term) were typically made using grain flour and water, and would depict Biblical scenes, crosses, and other religious icons. They were often served after meals as a symbolic final blessing. After the church gave artisans permission to make their own oublies, designs proliferated to include family crests, landscapes, and numerous other artistic flourishes. As the Crusades and other ventures abroad brought back spices like cinnamon and ginger, cooks began to liven up their oublie batter. Cream, honey, and butter made their way into the mix, as did leavening agents that made the wafers thicker and doughier. Irons became deeper, and gradually the wafer became the wafel, or the gaufre, as the French called it. Around the 15th century, Dutch wafelers began using rectangular instead of circular plates, forging them into a grid pattern. Sources aren’t clear on why, exactly, this grid pattern developed—some say it emerged naturally from the forging process, while others say it offered a way for artisans to cook less batter over a greater surface—but regardless, it was the precursor to the modern waffle’s design. Take Flower, Cream, Sack, Nutmeg, Sugar, Eggs, Yeast, of what Quantity you will; mix these to a Batter, and let them stand to rise; then add a little melted Butter, and bake one to try; if they burn, add more Butter: Melt Butter, with Sack, refin’d Sugar, and Orange-Flower Water, for the Sauce. Throughout Europe, countries developed their own waffle recipes and accompaniments. In Germany, a coffee waffle became popular, while in France, gaufres were made using cloves, Spanish wine, and lemon zest. In Belgium, legend says the Prince of Liège’s chef made a thick waffle coated with caramelized sugar, reputed to be the first Liège waffle, which today is one of Belgium’s most popular waffle varieties. In contrast to contemporary America, waffles weren’t a breakfast food but rather a between-meals snack or a dessert. And they weren’t served with maple syrup, either. The French bought them from street vendors and ate them by hand, while the Dutch enjoyed them in the afternoons along with tea and chocolate. It wasn’t until waffles came to America, courtesy of the Dutch, that they were finally paired with maple syrup, a popular liquid sweetener that was cheaper and more widely available than granulated sugar, which had to be imported. As early as the 1740s, colonists in New Jersey and New York were having parties known as "wafel frolics," which sound amazing. Thomas Jefferson, who loved waffles so much that he brought four waffle irons that he bought in Amsterdam back from his time in France in 1789, regularly served waffles at Monticello along with other shockingly modern foods like ice cream, French fries, and macaroni and cheese. Still, waffles were to remain a fringe food until they became easier to make. In 1869, Cornelius Swartwout of Troy, New York patented the first stovetop waffle iron [PDF]. Made from cast iron, it had a hinged top and handle made to cook waffles quickly and without burning hands. Twenty years later, the Pearl Milling Company came out with the first commercial pancake and waffle mix, which it called Aunt Jemima (named, unfortunately, after a popular minstrel show character). These two innovations brought waffles into thousands of American homes, and with the introduction of General Electric’s electric waffle iron in 1918, they quickly became a must-have addition to the modern kitchen. A few decades later, three brothers from California would revolutionize the waffle industry and breakfasts everywhere. In 1932, Frank, Anthony, and Samuel Dorsa started a food manufacturing company in their parents’ basement in San Jose. Their first breakthrough, Eggo Mayonnaise, so named because it used "100 percent fresh ranch eggs," became a local success, as did a waffle batter they sold to consumers and restaurants. The brothers also developed one of the first dry waffle mixes, which required just milk to create a rich, thick batter. The Dorsas were so successful that after just a few years they moved out of their parents’ basement and into an old potato chip factory, where they expanded into other categories like chips, noodles, and pretzel sticks. Eggo seemed bent on taking over the grocery aisle, but in the early 1950s, Frank—a machinist and food processor by trade—developed a large, carousel-like contraption that would change the direction of the company. Frank’s machine turned out waffles by the thousands, which were then frozen, packaged, and sold in grocery stores. “Froffles,” as they were called, were an absolute hit with consumers. Not only did they ride the tidal wave of demand for frozen foods at the time, they also created their own category: For the first time, people could enjoy waffles without having to make their own mix and throw it on a waffle iron. In the convenience-obsessed '50s, when women began leaving the household and taking jobs, being able to save time in the mornings was a big sales-driver. That name, though—that just wouldn’t do. In 1955, Frank changed the name of his frozen waffles to match that of his other products. Today, 40 percent of American households eat Eggo waffles. For as much progress as American food minds had made with waffles, Europe still had a thing or two to teach us. In 1964, at the World’s Fair in Queens, New York, visitors to the Belgian Village flocked to a quaint hut with gabled rooftops that advertised "Brussels Waffles: A Bel-Gem Product." Inside, Maurice Vermersch, along with his wife Rose and daughter MariePaule, sold light, flavorful waffles for $1 each, served one of two ways: plain, or topped with fresh-cut strawberries and whipped cream. To Americans used to heavy, butter-and-syrup coated waffles, the Vermerschs’ concoction was very new and very odd. But in many ways, it was the waffle in its purest form. "They would say, 'How come it’s so light?'" MariePaule recently recounted to New York’s Daily News. "They were so used to heavy American waffles." To keep up with demand, the Vermerschs had 24 waffle machines going nonstop and 10 people hand-slicing strawberries. The Vermerschs’ waffles became one of the fair’s biggest hits. There was just one problem: People were confused by the name. Although the Brussels Waffle was and still is a specific variety of waffle found in Belgium—one of several that typically vary by region—many people didn’t connect it with the city, or the fact that it came from Belgium. So Maurice and Rose decided to change the name to Belgian waffles. In the years that followed, that Americanization continued as Maurice Vermersch, like so many American entrepreneurs, lost control of his signature product. Belgian waffles moved into the nation’s kitchens and restaurants. They became richer, heavier, and as big as the plates on which they were served. They were stacked high and topped with chocolate sauce, whipped cream, berries, sprinkles, nuts, and of course, maple syrup. They became, as MariePaule Vermersch and other waffle gurus have noted, a waffle that’s Belgian in name only. Not that this really mattered to those in the food industry, who continued to push waffles in all shapes and forms. In the '70s, the Kellogg Company bought Eggo and soon after developed the slogan, "L'Eggo My Eggo." As it grew, the company—along with its competitors—developed line extensions like mini waffles, waffle sticks, NutriGrain waffles, flavored waffles, and gluten-free waffles. Choice proliferated on the restaurant side, too, and these days you can go traditional with a Waffle House waffle, be bold with a waffle sandwich from the likes of Butter & Zeus, or tuck into a plate of chicken and waffles, a popular Southern dish that’s showing up on menus across the country. In the span of a few centuries, the food that began as a bland cake has become a fun-loving, endlessly customizable treat—one that has managed to find success as both a processed food and an artisan, made-from-scratch product. There’s even room, it seems, for authentic Belgian waffles to make their glorious return. In New York, Wafels & Dinges food trucks pay homage to the Vermerschs with a Brussels waffle ("Back and better than ever!" according to the menu). At The Waffle Window in Portland, Oregon, cooks make Liège waffles the traditional way, from dough mixed with pearl sugar. At the New York State Fair in Syracuse, meanwhile, you can find the only waffles that follow the exact recipe the Vermersch family used more than 50 years ago. MariePaule, who had kept the recipe a secret since then, sold it in 2002 to a local vendor, under the condition that he continue to keep the recipe a secret, and only operate once a year during the fair (MariePaule herself used to run a coffee shop in Albuquerque, and on occasion makes the waffles for catering events). In a recent podcast interview with WNYC Radio, MariePaule said she took her wheelchair-bound 95-year-old mother to the fair and let her sample the waffles. For years, Rose had been bitter about the direction Belgian waffles had taken in America, and the fact that she and Maurice hadn’t further capitalized on their popularity. But that day at the fair, according to MariePaule, Rose seemed to forget about all that. "She ate three in a row and said, 'These—these are my waffles,'" she said.